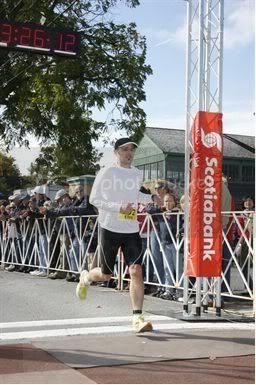 I entered the Georgina Mini Marathon, a Ten Mile Road Race, Saturday. Terrific scenery and great location. But race execution was a disaster. This was the third year for the event and the first year for me. Lots of issues. The organizers did not sufficiently address the #1 concern from runners in year 2 - lack of water on course. The race had some dangerous spots - most notably there was an unmarked crossing across Park Drive, where weekend travellers often approach Sibbald Point PP at speeds up to 110 kph. And when I descibed how runners ended up on the wrong route to the Race Director postrace, she replied "That happened last year too but we caught it sooner." The course was more and more poorly marked and less safe the more remote we got from the Start/Finish line. I knew something was up when I approached a fork in the road at 9.5K, where the main road for traffic purposes curved right but I recalled from the race map that I needed to go straight. I called ahead to volunteers "Which way?" I was told "Straight Ahead." 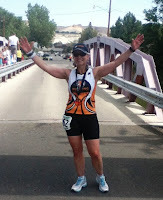 As I trotted off, a volunteer remarked "You're the first runner to go the right way." Another fork came up quickly, this one with no volunteers, I could not see any pylons in either direction and wrongly chose right as I knew we needed to take a right eventually and I could see the last of the nine runners ahead of me running on that road (they had taken a diagonal route there.) But I should have gone straight - I had made only part of the correction needed. So the first nine runners ran 1.031K too short. #11 and I, in 10th, went on a route 973m too short. I believe the 12th place runner made the rest of the route correction. I finished in 1:09:16. Pacing was tough as I thought the course seemed like it would end before 16.1K with the route we were taking despite the fact that I thought I had taken the right turns. So not sure when to pick up the pace, though it was warm and I had little to give. Will consider a 15K result - the shortage suggests this was slightly longer than 15K, my GPS indicates I ran slightly less than 15K. So a 15K route +/- 1%. I was on pace for a small Ten Miler PB and ended up with a small 15K PB. 10th place. But I had no chance to catch 9th and 12th had no chance to catch 10th and 11th due to the disparity in distances run. No need to enter this one, Maniacs. thanks for the review - sounds like a bit of a disaster! Good day for a run, bad day for a race. I had been meaning to support this event, the only one in the town I live in, but could not in prior years. I had heard tales of poor execution from last year and thought nothing of it, surely they would address. But they did not. And participation was down significantly from last year to this year already. Who knows who will turn out next year. There is very well run spring and summer events in nearby Uxbridge and Lindsay. Wow- that sounds pretty bad! Keep on rolling, just a mile to go. Keep on rolling my old buddy, you're moving much too slow. I had a couple of girlfriends running there as well, gave the same review as you did. Congrats on a great result at a not so great event!